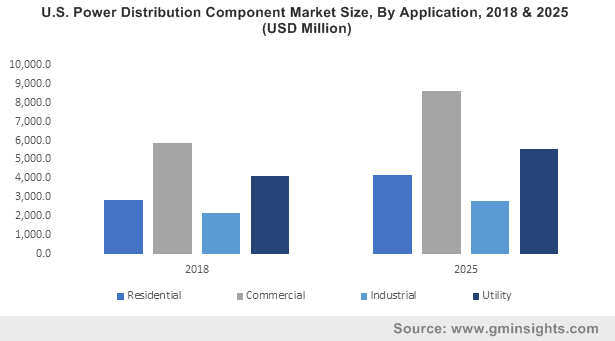 Global Power Distribution Component Market size in 2018 exceeded USD 90 billion and is anticipated to grow over 6% by 2025. The power distribution component industry has witnessed an upsurge on account of the growing demand for effective T&D control systems. Rising demand for refurbishment of prevailing electrical setup coupled with regulatory & fiscal restructuring across the industrial peripheral will complement the business potential. Lack of efficient and reliable electric network across the developing nations along with a shift toward the enhancement of existing infrastructure across developed economies have further integrated a favourable business scenario. Economical costs, safe operation, and product compactness are some of the essential parameters driving the industry growth. Distribution panels & circuit breakers in the current regime have gained eminence on account of product versatility & diverse applicability across distribution networks. The products yield wide applicability across diverse applications ranging from low voltage suburban networks to utility-based distribution infrastructure. With increase in adoption, industry participants & manufacturers have aligned their focus towards the development & effective distribution of the products. Henceforth, favourable consumer tendencies and product versatility favoured by cost-effective configurations will augment the market share. 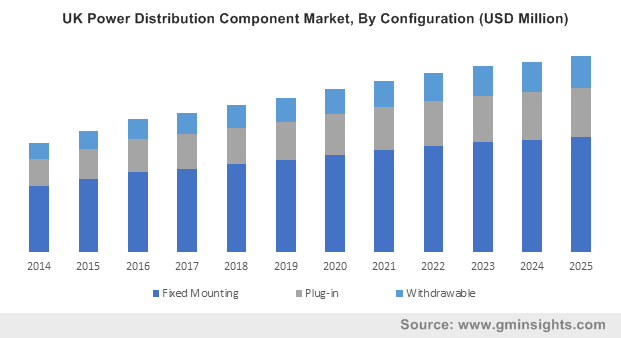 Fixed mount power distribution component market is expected to surpass USD 80 Billion by 2025. The products have witnessed steep penetration across high voltage utility & industrial distribution networks. Although, the configuration has appreciable deployment across commercial and residential distribution networks however, the industry dynamics are paved based on their integration across comparatively higher voltage networks. Manufacturing units, process plants, oil & gas exploration & extraction and similar industrial peripherals demand for higher ampacity and voltage rating infrastructure which will stimulate the product demand. Voltage rating have been the standard industry protocols for the deployment of electrical components depending on the application areas, regulatory preference, and the category of technologies to be enclosed. The rapid expansion of low-voltage distribution networks across commercial & residential establishments have positively impacted the < 11kV power distribution component market size. Moreover, flexible product configurations, operational performance and aesthetic proximity are the prime factors influencing the product deployment. Vacuum insulation in 2018 held over 50% of the global market share. Lower competitive influence from other established insulated technologies, high consumer reliability, economical price, reliable & safe operation, and leakage-free technology have been few indispensable characteristics driving the product demand. Although, the components incur comparatively higher initial costs than auxiliary insulation technologies however, utility preference and consumer inclination has favoured its deployment owing to longer lifecycle and lower maintenance costs. Indoor power distribution component market is projected to grow over 10% by 2025. Rising space constraints along with ongoing investments in R&D for the development of smart and compact control equipment will fuel the product adoption. Continuous investments across residential and commercial establishments including public and private apartments, offices, educational premises, communication & data centers along with similar space constraint establishments will further complement the industry outlook. 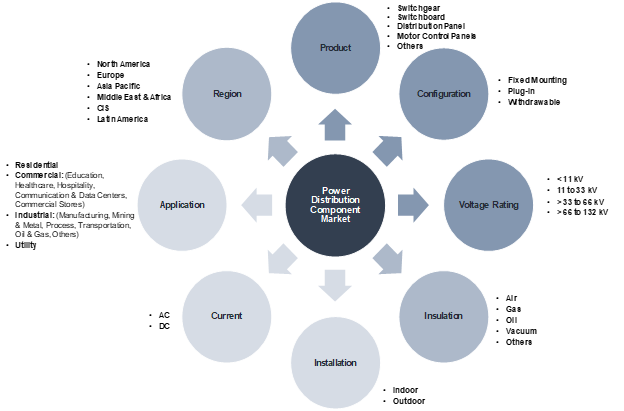 AC power distribution component market will witness a growth owing to the key product features including economical losses, lesser heat generation, effective and flexible high-end voltage levels. Ease of handling and conducting properties coupled with ease of transformation will further thrust the business outlook. Moreover, competitive lay-down costs, economic machinery cost, ease of installation and manufacture are few indispensable parameters driving the product demand. Digitalization has been an industrial phenomenon, driving the adoption of smart and secure electric infrastructure. However, communication and data-based centers have been a key to economic and regional proliferation. Data analysis synced with digitalization has proved to upscale the technical, economic and regulatory proximities. Furthermore, expansion of data centers and communication hubs have also raised the energy consumption rate. Henceforth, effective energy infrastructure is the key for continual operations of these centers as major government & public agencies rely on the real time data and analysis. Henceforth, rapid growth in demand for energy to sustain the functionality of the data units will augment the global market share. The U.S. market is expected to witness an annual installation of over 9 million units by 2025. Growth in demand due to increased fund flow towards the development of long-distance distribution networks & refurbishment of domestic electric infrastructure have energized the industry landscape. The U.S. Government in 2018 led plans to spend USD 10 billion to develop new electric networks, which is expected to reduce the curtailment rate of the Western Transmission & Distribution (T&D) Network. The growing focus on the replacement of traditional electrical equipment with advanced high-quality systems will thrust the product demand. 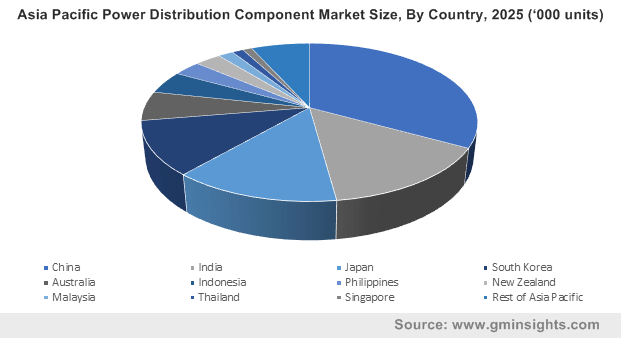 In the recent years, the power distribution component industry across Middle East, Africa and Asia Pacific has observed substantial progression owing to the rising demand for effective Transmission and Distribution (T&D) systems. Increasing demand for restoration of prevailing electrical setup along with rising investments across the energy infrastructure sector will augment the business growth. As per a leading publication, regulators across Saudi Arabia in 2018 have proposed an investment worth USD 133 Billion across its Energy and Water projects. Prominent market participants include GE, ABB, Eaton, Schneider, Siemens, Hitachi, Powell, Hubbell, Fuji Electric, L&T, E+I Engineering, Lucy Electric, Al Hassan Engineering, START, Norelco, Skema, Mitsubishi, Rittal, Hyundai, Hyosung, and CG. Product assortment, technological collaborations and application focussed research & development have been the key strategic implications as pursued by the leading industry participants. These are electric components deployed to integrate a sustainable electric supply infrastructure. The products are characterized by voltage ratings and find applications across primary and secondary distribution networks.